You throw Rocky Balboa and Jake LaMotta into the ring and you expect an all out bloody dogfight to the finish. You throw those two opposite of each other onto the big screen, and you have a shallow, awkwardly paced light drama that will leave you unsatisfied and confused as to what Hollywood execs were thinking when they greenlit Peter Segal’s Grudge Match. 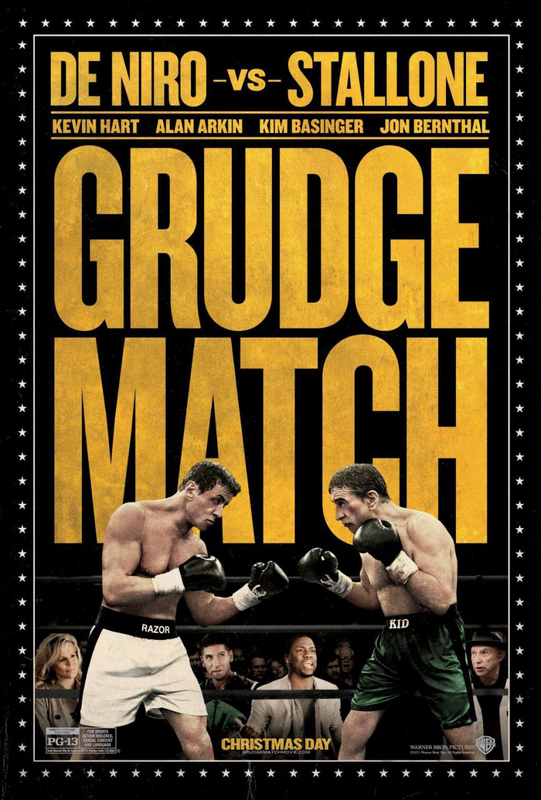 Grudge Match is a story of two old time boxing rivals Billy “The Kid” McDonnen (Robert DeNiro) and Henry “Razor” Sharp (Sylvester Stallone) that jump in the ring one last time to settle a lengthy score. Razor retired the night before the title fight between The Kid 30 years ago. Now, thanks to promotional manager Dante Slate Jr. (Kevin Hart) and a physical altercation gone viral, these two have the opportunity to squash the conflict. Cue two out-of-touch retired boxers throwing on the gloves and training like their former lively selves. 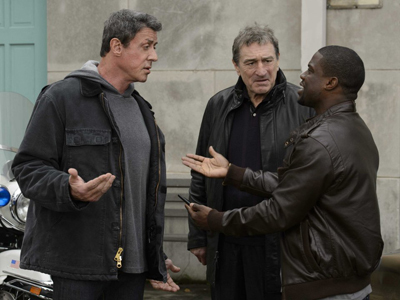 The film may pose as entertaining with De Niro and Stallone inadvertently reprising their roles as boxing greats from their yesteryears. However, that doesn’t seem to be the case, especially when the legend of De Niro stands toe-to-toe with the one-trick pony of Stallone. Regardless of De Niro’s recent flops, it’s awkward and unfulfilling to watch an actor of his prowess being evenly compared to that of Stallone’s machismo, and emotionless presence any time he steps in frame. It appears that De Niro must step down to a lower level of acting in order to play the role. For a film that appears to base most of the attention on star power, you’d think there would at least be a little more natural chemistry between the two. The actors are only as good as the writing in most cases, as is the point here. There were plenty of holes in the script and character development as well. The boxers from Raging Bull and Rocky, are jaded underdogs battling inner demons of isolation and anger. Kid and Sharp are portrayed, one as a glory hound and the other a sappy, tormented soul. Aside from the shallow characters, the story’s pacing was completely off-kilter. The much anticipated fight that would serve as the climax dragged on, and lost any sense of victory or loss for either side when the results were given. It appears that the writer tried to throw in a few sub-plots of family drama and lost love to avoid the title of just another boxing movie. My bet is that the film would have been better received as an all out brawl fest. At least then the audience would have some sympathy for one of the characters getting his brains beat to a pulp. Aside from the heavy criticism dealt here, there are some consolations to Grudge Match that could win points with an audience. Those would be the supporting performances given by Kevin Hart, Alan Arkin, who plays “Lightning” Sharp’s aging trainer, and Jon Bernthal, who plays Kid’s long lost son. Hart and Arkin provide comedic relief from two different angles of comedy. Hart, who plays the promotional manager Dante Slate Jr., plays into his typical comedic style that audiences love with its exaggerated reactions and tiffs with Lightning. Arkin delivers a perfect performance of an aged trainer fallen from glory, but fully accepting of his age. His subtle, yet well-timed exchanges with Slate and Sharp give off the vibe of a Northern foul-mouthed, boxing nut. Bernthal plays B.J., Kid’s estranged son from a one-night stand. Bernthal gives a solid performance of a hurt, yet vengeful son who seeks stability with his biological father. Despite the positive supporting roles, I wouldn’t deem this film worth the price of admission. It’s comprised of great laughs, but dragged down by shallow characters and lackluster story development. The audience will leave unsatisfied, and unable to retrieve those 2 hours of time that could be better spent on other Christmas-released films. Grudge Match opens Christmas Day in Philly area theaters.